My husband once told me that this recipe is the reason he married me. So I love it not only because it tastes great and it got me a husband, but also because it only uses one bowl and always seems to turn out perfect. 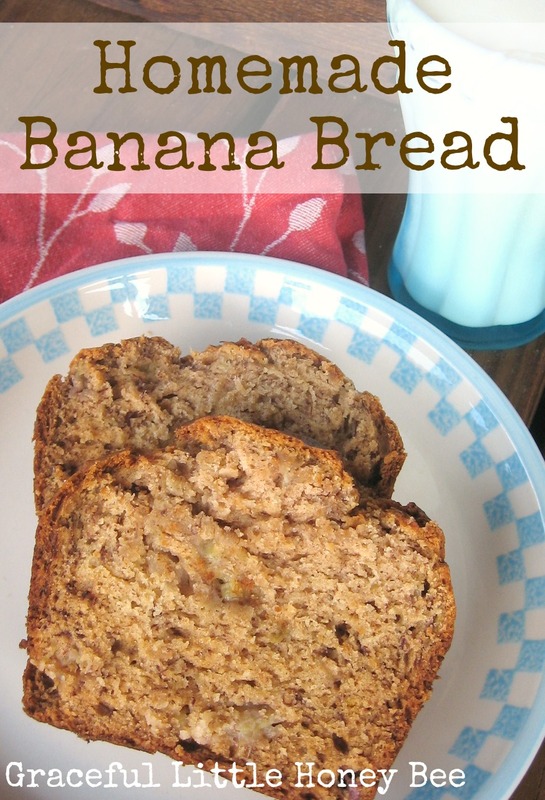 I don’t know about your family, but mine goes through 3-4 bananas per day so I almost always have extra ripe ones hanging around to make up a loaf of this awesome bread. Also, you can make them as muffins here. Step 1: Preheat oven to 350 and grease loaf pan. Step 2: In mixing bowl, mash bananas with fork. Step 3: Add melted butter and stir. Step 4: Mix in sugar, egg and vanilla. Step 5: Mix in baking soda, salt and cinnamon. Step 6: Add flour and mix until just combined. Step 7: Pour into loaf pan and bake for 1 hr or until knife in center comes out clean. Preheat oven to 350 and grease loaf pan. Mix in sugar, egg and vanilla. Mix in baking soda, salt and cinnamon. Pour into loaf pan and bake for 1 hr or until knife in center comes out clean. I appreciate that you know the difference between "lie" and "lay" and correctly use them. Oh this looks so yummy! I'm pinning it! :) Btw. I got lots of bananas today for a discount price, because the store was getting rid of the blackened ones. They are just perfect for this recipe and I'll use the rest for fruit leather and freezing for cakes and breads in the future. Ripe bananas make the best banana bread! Way to snag a great deal and be resourceful!! Saw this on Pinterest and finally got around to making it. Literally the BEST banana bread I've every made! I put a few choc chips in it and my husband loved it! Thanks for such a great, and super easy recipe! I'll be making this again and again. What size loaf pan do you use for this recipe? What size of loaf pan did you use? My loaf pan is 8.5 x 4.5 and about 3 inches deep. I've use larger ones with this recipe too. Delicious!! Moist!! Light!!! Simply perfect!! I took the liberty to add chopped walnuts which for me really compliments the recipe.